Samsung has introduced a Pro branded Galaxy Tab with 8.4 inches, and as expected Samsung is calling it Galaxy Tab Pro 8.4. It comes with 8.4 inch display and runs Android 4.4 kitkat operating system. And since it is meant to compete with the retina iPad Mini, the Korean giant has equipped it with a 2560×1600 pixel display. 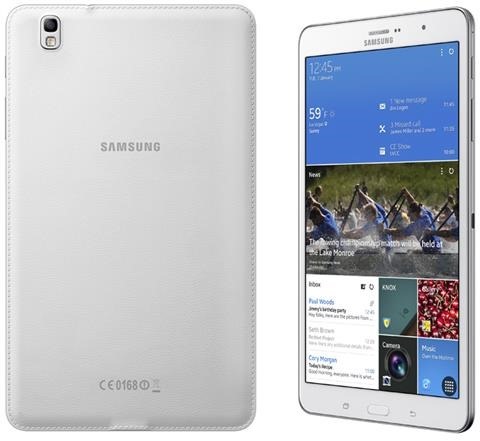 Full Samsung Galaxy Tab Pro 8.4 Specs include quad core Snapdragon processor 800 that runs at 2.3 GHz clock speed, Adreno 330 graphics chip, 2 gigabyte of RAM, 16 GB / 32 GB of flash storage, and a 8.4-inch display with a resolution of 2560 x 1600 pixels. Unlike Tab 3 7.0, the Pro 8.4 will be a part of premium devices and will cost more than non-retina Galaxy tabs so far.